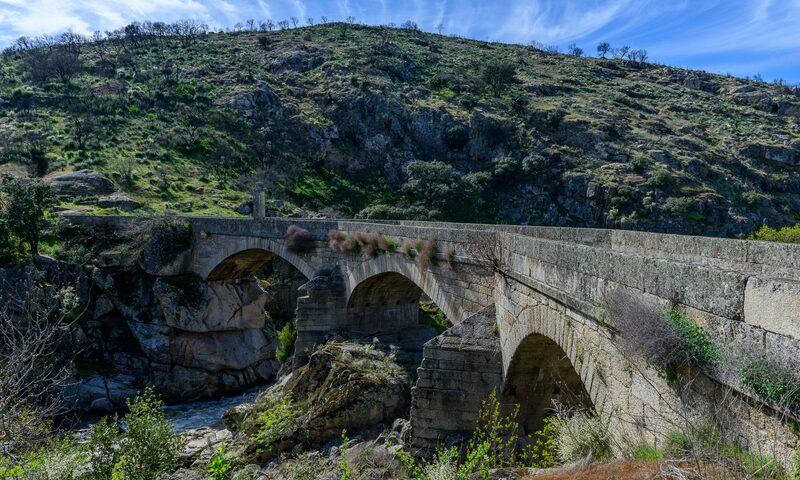 Lord Wellington is one of the most important supporting characters in the Peninsular War Saga. He first met Paul van Daan on a hillside in India when Paul was an arrogant young lieutenant and it was the beginning of a friendship and working relationship which lasted the rest of Wellington’s life. Devlin laughed. “You were unlucky, laddie. Normally these affairs aren’t so exciting. Come and be properly introduced. “I’m not sure I want to be,” Graham said. Graham complied, admitting to himself that he was curious. His impression of the colonel had been of a towering personality with a temper but he had nothing other than that to go on. 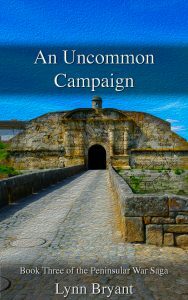 On the ride across to the abandoned convent where the 110th regiment had apparently been billeted until they had marched north to fight at Sabugal, Graham glanced at Devlin. “So what’s the story, Captain?” he asked quietly. 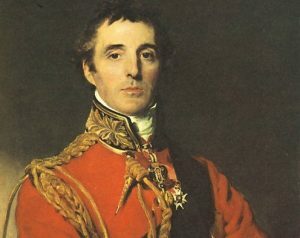 Since I decided to write a series of books set in the Peninsular War, I have spent an inordinate amount of my time reading about Sir Arthur Wellesley, later Lord Wellington, who led the Anglo-Portuguese army during it’s five year struggle against Napoleon’s forces in Portugal and Spain. I started knowing very little about Wellington and I have ended up by feeling surprisingly attached to him. My knowledge of Wellington, to be honest, came from my schooldays when I studied nineteenth century politics in history. He was Prime Minister twice, not very successfully, pushed through Catholic emancipation and fought strenuously and unsuccessfully against the Reform Bill, and in my mind he was always a slightly grumpy and very superior elder statesman who looked down his nose at the young Queen Victoria and disliked change and modernisation. For my Napoleonic fiction books set during the Peninsular War I have had to go right back to the early days of Wellesley’s career. When he is introduced to the young Lieutenant Paul van Daan in 1802 he is a relatively young and inexperienced general with his greatest victories in the future. He had not yet made his disastrous marriage to Kitty Pakenham and the battle of Assaye, which brought him his knighthood and some public attention, was a year away. He was ambitious, single minded and determined, a moderate drinker for the time, a serious student of military affairs and a man who enjoyed the company of women. Even then, he struggled to delegate, and preferred his officers not to show any initiative or to take matters into their own hands. As I began to read more about Wellington’s character it became obvious that I had accidentally stumbled on the perfect foil for the flamboyant, unpredictable bad boy of the 110th infantry, Lieutenant Paul van Daan, a character I’ve had in my head for a while. On paper, Paul is everything Wellington likes to see in a young officer; he’s dedicated, intelligent and courageous. In reality, Wellington the control-freak is about to come up against a force of nature and their disagreements are frequent and explosive. While Paul’s love story is at the heart of the novels, his relationship with his commander-in-chief is almost as important. Increasingly through the years of war, Lord Wellington felt isolated and under siege from political influences in London and worn down by lack of money, men and resources and the limited pool of talented officers available to him on the ground. It increased his tendency to control every aspect of his campaign and the running of the army himself and anybody who reads the volumes of his letters and despatches will quickly begin to realise how involved he was in the detail of administration. There were few men in his army that Wellington felt comfortable with, but his friendship with the young officer he had first singled out on a hillside in India endures the storms of war and politics. It was a source of envy and resentment among some of the other officers but it was very much understood by Anne, who has her own surprisingly close relationship with the commander in chief. When I set out to write these novels, Lord Wellington was supposed to be a subsidiary character with little to do apart from to issue orders. As so often happens with subsidiary characters, he developed a mind of his own and began to intrude into the action in the most unsuitable manner. As he is a general, I thought it best to let him have his way.